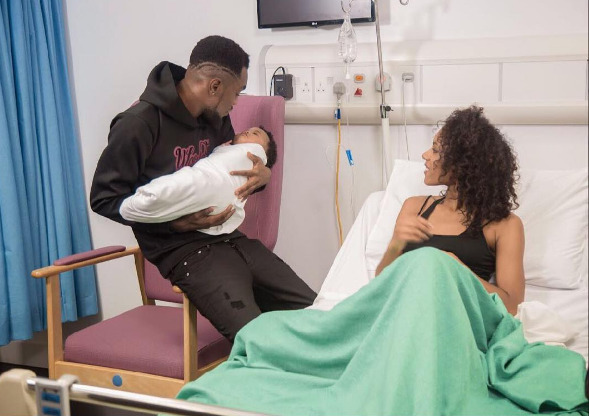 Last week singer Patoranking made news when he shared a photo of himself and a pregnant lady with a caption suggesting he is set to become a father. The singer has however come under massive fire after he shared a photo of himself holding a baby with the lady in the former picture looking on as he cradled the child. Many began sending in congratulatory message but a few had one or two things to say about the photo with most alluding the picture if from a music video shoot. sinphia_phrancis-That's a very big newborn... I'm sure there is a story behind this. What do you guys think though? Maybe it has a big head? Social media.. cant people just live their life privately in peace ? Must we react to everything too ? Okay, Gossip blogspot blog with a custom domain up for grabs... 4k followers facebook fanpage up for grabs... shoot me a messagee sharp! Wait oh,how did that baby pass that place ? Is this acting or what? I wonder oo.watin person no go see for Nigeria..
O ga o! Even new Borns are not spared of the lack of civility of the social media!